We all live on the same physical planet, but the information worlds we inhabit must be vastly different. This are many reasons for this other than language, but language alone is enough to isolate humanity from itself. And so, my question: how many islands are there in our multi-cultural information space, and how are they connected? I am willing to bet that a full-scale web map would show several large networks in the main languages of the web — English, Chinese, Spanish, Japanese, German, etc. — but few connections between them, web sites frequented by bilingual or bi-cultural individuals, who after all are the true gateways between cultures. 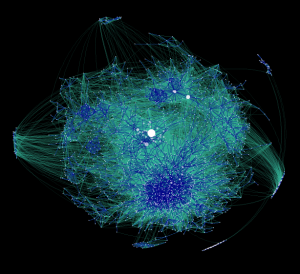 The structure of the interconnections might tell us something about the relationships between cultures, and the actual number of links might provide some measure of how close or how far apart we actually are. The individual URLs themselves would also be extremely valuable information, representing high-bandwidth links between cultures, the trans-occeanic fiber between continents in the infosphere. There is a second geography to the world that we’ve never seen. I don’t even know what I’m missing. Creating such a map would be a trick, but by no means out of the reach of an academic project or a small company. Google says there are currently over one trillion (10^12) unique web pages (for their particular definition of “unique”, which is more complex than it might seem.) Unlike a search engine, a language-based web map does not require the full contents of every page, merely the outgoing URLs and a discrete categorization of the language (which can be automatically determined even without any document meta-data.) Assuming that each URL is assigned a unique 32 bit ID, another 32 bits for language and other info, and then links to an average of 20 other pages (estimates vary), this is about 100 terrabytes of data — or perhaps $15000 worth of storage at current prices. This index could be created from a fresh crawl, or by parsing an existing one, such as from the folks at the brand new and very awesome DotBot open index of the web. The next step would be to generate the visualization of such a massive data set. The complete graph could be laid out in two or three dimensions using existing clustering methods. The resulting map could be traversed using GPU-accelerated rendering techniques for very large data sets, probably after some sort of hierarchical pre-processing that produces proxies for zoomed-out views of the network. A usuable UI would be crucial; the entire map needs to be navigable at multiple scales and composed of live, hyperlinked objects. The right visualization also depends on what you are trying to discover; ultimately, there can be no single map because the choice of visualization is dependent upon usability and aesthetics, as the huge variety of beautiful maps at Visual Complexity demonstrate. The analysis could go much deeper with more computing power. Machine translation is currently poor, but it is probably good enough to detect whether one document is a translation of another. With this capability, we would actually be able to quantify the percentage of (public) textual information that makes it from one language into another and identify the key organizations that act as conduits. Further study might reveal fascinating things, such as selection biases in the types of news or information that get translated. The implications for differences in belief between cultures are obvious. Yet even a “links only” data set could still answer some highly revealing questions, such as “what percentage of web sites are visited by people from multiple cultures?” or even “what is the best gateway between Polish and English film reviews?” This could be done without visualization, but it would be a mistake not to draw the actual maps. Not only do pictures engage our spatial reasoning in a way that raw bits never can, but such a map would re-make an obvious point that is too often lost: in terms of communication between cultures, the world is not nearly as small or interconnected as we’d like to think it is.